Please pray that this court decision will be overturned and that religious freedom will be restored. 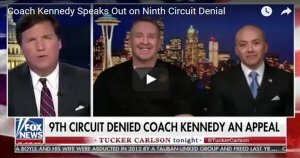 Attorneys for First Liberty Institute and Kirkland & Ellis LLP filed a petition for writ of certiorari with the Supreme Court of the United States on behalf of former high school football coach Joe Kennedy, asking the nine Justices to reverse a lower court decision that allowed a school district to fire him because fans and students could see him take a knee in silent prayer after football games. Kennedy was head coach for the Bremerton High School junior varsity football team and an assistant coach for the varsity team. Before he even coached his first game, this Marine Corps veteran turned football coach made a commitment to God that he would give thanks after every game—win or lose—for the opportunity to be a football coach and for his players. So after his very first football game in 2008, Coach Kennedy waited until the players cleared the field, then took a knee and silently thanked God for his players. Coach Kennedy continued doing this after every game for seven years and no students, coaches or parents ever complained about it. In fact, it was a compliment that started the problems. After receiving a compliment from a school administrator about how they were grateful for Coach Kennedy’s leadership and great example for the team through his prayers, Bremerton High School responded with a demand letter to the coach threatening his fundamental right to free speech and religious exercise. The Bremerton School District superintendent sent Kennedy an official letter from the school district, telling him that he must stop praying after the games…. Coach Kennedy filed a charge of religious discrimination with the Equal Employment Opportunity Commission (EEOC) against Bremerton School District. In response to Coach Kennedy’s EEOC complaint, the U.S. Department of Justice issued a right-to-sue letter to Coach Kennedy and First Liberty Institute filed a lawsuit against Bremerton School District. A federal district court dismissed the lawsuit and First Liberty filed an appeal with the United States Court of Appeals for the Ninth Circuit. Thank You Heavenly Father for Christian teachers, coaches, and other school staff who take a stand for their beliefs. I pray that You would protect them from being harassed by non-Christians. May Your Word go forth in our schools as it did when the USA was formed. Your Word was the main text for children of all ages. Forgive us Father for allowing Your Word, prayer, and Christian songs to be removed from the public schools. Lord, let Your Word go forth in power. Amen. Father, You know that the 9th circuit court is well known for its rulings against all things righteous; it stands against many of the decisions the President has made on behalf of the well-being of the people of this country, and it stands against people who only desire to exercise their rights to free speech and freedom of religion. I agree that You convict the judges who sit on the bench in this court of their godless decisions, and that You break the spirit of power-love that rules over their jurisdiction! I pray that the coach’s suit will result in a win just to stop this activity from the bench where justice is supposed to be done and is not! I ask it in Jesus’ Name and for Your honor, Lord. Freedom of religion and freedom of speech is the rule. 9th circuit is wrong, again. Coach Kennedy is within his rights, particularly since it is a public school district. Let’s stop operating in fear and celebrate our freedoms. This type of discrimination should make us fall on our knees and pray for Mercy in our forsaken nation and it’s Godless Leaders, including judges who forsake our Constitution!